This week we were invited up to watch Flavia and Vincent’s new hit show Dance ‘Til Dawn, which is currently at the Aldwych Theatre in Covent Garden. As expected Covent Garden was twinkling away with Christmas Lights, giant Christmas trees and even a Lego reindeer scene, which certainly got us feeling festive! Having not seen their previous show we were unsure what to expect. For those who are wondering what the show has in store and without giving too much away….. Dance ‘Til Dawn transports you to the glitz of 1940s Los Angeles, and in the midst of filming the leading man is murdered. A love story develops between Tony (Vincent) and the gorgeous starlet Sadie (Flavia) as they try to dance their way out of trouble. The show combines comedy, romance, dance and a live band. The sets are fabulous and the scene changes are effortlessly smooth within the dances. Costumes are fabulous and keeping within the times. The cast are truly spectacular and within a class of their own, singing and performing intricate moves as effortlessly as breathing. Within the hustle and bustle of the stage you cannot help but be captivated by Flavia and Vincent. Flavia’s solo dance including a breath taking drop (those who have seen it will know what we mean!) oozing fierce sassiness and emotion, was nothing short of amazing. What shouldn’t go unnoticed is the live band. The songs were perfectly linked with the story line, Oliver Darley pops up around the stage singing the accompanying hits including Stand by Me, Cry me a River and Mi Mancherai. His voice is smooth and enchanting; the songs within the show have also been included in his newly released album, which we have now downloaded. The leading Lady – Lana Clemenza played by Amy Osmon is glamorous, witty and wows us with her show stopping vocals and little quips. A true stage show leading lady! Flavia and Vincent showcase their dancing repertoire including the samba, foxtrot, paso doble and of course their infamous tango; leaving us with open mouths of amazement. Their dances have the ability to bring tears to the eyes and goosebumps to the skin (we are guilty of both of these), but it is their finale of the tango that is unbelievable and out of this world. 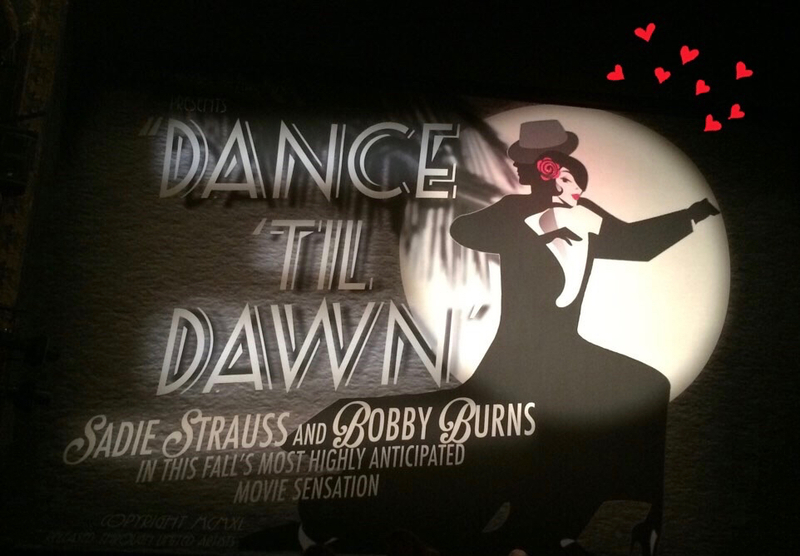 A goofy humorous murder mystery, from start to finish Dance ‘Til Dawn is truly captivating. 2 mesmerizing acts running for a total of 2 hours, frankly we could watch for many more; both acts are faultless but if we had to pick our favourite it would be the second purely because of the finale. They have perfected the perfect balance between musical and dance show and would easily please anyone and everyone. The cast are truly spectacular, the choreography and execution of each and every dance is intricate, precise and astonishingly spellbinding, and most of all they all look like they are having the time of their lives up there. To us, we know it is a fantastic show when you come out thinking that you could happily watch it again with the same, if not more enjoyment; and thats exactly what we will be doing when it goes nationwide. Seeing Dance ‘Til Dawn is an absolute must and we cannot recommend it highly enough. Dance ‘Til Dawn is at the Aldwych theatre until 3rd Jan 2015 and will then be going on tour nationwide. Ticket and tour information can be found here. If you have any thoughts, feelings or comments then please do comment below, I’d love to hear from you. Fantastic show. Saw it at Hull New Theatre had a great time watching it. Great singing superb dancing and lots of fun. What more could you want.